This timepiece belongs to the family “Art & Technik” which brings together masterpieces that combine together the unique craftsmanship, extraordinary technical ability and craftsmanship of Glashutte Original. 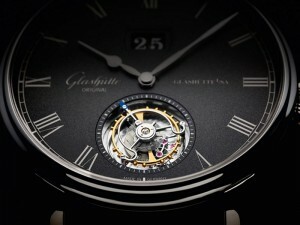 Glashutte Original Senator Tourbillon and the image of the classic style declined in white gold. The 42 mm case is now presenting a more tapered bezel compared to that of previous models Senator, showing better the quadrant characterized by a charming gray tint microporous. The dial features Roman hour markers and a classic outline of the hardware to “chemin de fer” etched into the surface. The characteristic Overview Date and built with white numbers on a dark background and positioned at 12 o’clock, while the balls pear made of white gold accentuate the elegance of the design. Pride of place on the dial and occupied by the superb flying tourbillon, which finds its ideal space to 6 hours as opposed to the Big Data. The Flying Tourbillon was developed in 1920 by master watchmaker Alfred Helwig, one of the best watchmakers and watchmaking teachers of German, who taught at the German School of Watchmaking since 1913. The traditional tourbillon mechanism, invented by Abraham-Louis Breguet to offset the negative influences of the Earth’s gravity on the accuracy of the clocks, and is anchored at the base of both its top. The variant developed by Alfred Helwig and became a famous flying tourbillon, and instead made up of a mechanism that secures the cage on one of its sides, thus creating the illusion of being suspended in the air. The balance wheel, anchor and escape wheel are housed in a cage that rotates 360 ° self-supporting in a minute, compensating for inaccuracies due to gravity. Born in watchmaking culture that developed in the town of Glashutte, the flying tourbillon is an extraordinary aesthetic invention, as well as functional and finds its natural place in Senator Tourbillon, timepiece 100% handmade in Germany. Under the classic suit of Senator Tourbillon Automatic Movement beats the Caliber 94-03, which provides 48 hours of power reserve. The flying tourbillon and clearly visible through the sapphire crystal. The barbell placed inside the cage of the tourbillon has the features 18 gold screws. From the sapphire crystal case are clearly visible the harmonious details typical of Glashutte watchmaking such as – to name just a few – the finishing tape and double sun, rhodium-plated surfaces, the components in steel mirror polished, blued steel screws and anglage always done by hand. The microrotor decentralized, other technical finesse, has a peripheral mass of solid gold 21 kt., The typical decoration with ribbon Glashutte, and the elegant double-G logo opposite of Glashutte Original that signify the look juts into the future with a eye to a glorious past. This movement meticulously refined and developed by the watchmakers of the department Atelier craftsmanship. The design and complemented by a gray strap in Louisiana alligator finish in nubuck leather with folding clasp in white gold.